Hot, happening Logan Circle restaurant/brewpub with American fare for every age. Open for Dinner Tues.-Thurs. 5:30 p.m.-10 p.m., Fri.-Sat. 5:30 p.m.-11 p.m., Sun. 5:30 p.m.-9 p.m., Brunch Sat.-Sun. 11 a.m.-3 p.m.
About the restaurant: Exposed brick and suspended light bulbs give the space at Birch & Barley a hip, industrial vibe. This Logan Circle establishment has a downstairs restaurant and a brewpub, Churchkey, upstairs. The obvious draw, of course, is the food-brew combo. What you eat at the former can be paired with any number of imported and domestic brews --- the smoky ones are terrific --- but if you are simply a dedicated foodie, focus on the main menu. Food & Drinks: Whatever else you may select, include the crudo of scallops appetizer, but remember that the menu changes regularly so be willing to try anything new. Flatbreads, generous enough for an entrée but still an integral part of any meal, might include lamb sausage or smoked mushrooms with Pecorino, rosemary butter, egg yolk and nettle pesto. As for entrées, any one of them will please, but for burger fans, the burger (topped with charred hatch chile and avocado salsa, fontina, pickles and mayo) delights even the most jaded palate. Satisfy your sweet tooth with Nutella stuffed doughnuts or strawberry-basil cake. 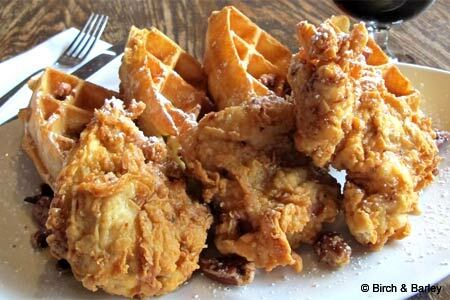 Fried chicken and waffles is the big draw at brunch. In addition to the aforementioned beers, there is a selection of wines, cocktails and sipping whiskies.